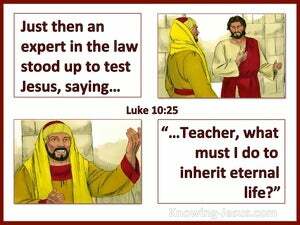 ﻿ Luke 10:25 And a lawyer stood up and put Him to the test, saying, "Teacher, what shall I do to inherit eternal life?" And a lawyer stood up and put Him to the test, saying, "Teacher, what shall I do to inherit eternal life?" Just then an expert in the law stood up to test Him, saying, "Teacher, what must I do to inherit eternal life?" Just then an expert in the Law stood up to test Jesus. 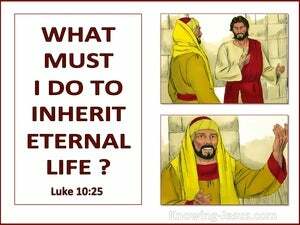 He asked, "Teacher, what must I do to inherit eternal life?" And behold, a certain lawyer stood up testing him, and saying, Teacher, having done what, would I inherit eternal life? And behold, a certain lawyer stood up and made trial of him, saying, Teacher, what shall I do to inherit eternal life? And then a certain lawyer arose to try (test, tempt) Him, saying, Teacher, what am I to do to inherit everlasting life [that is, to partake of eternal salvation in the Messiah's kingdom]? Just then a certain teacher of the law of Moses stood up and [attempted to] test Jesus, saying, "Teacher, what must I do to inherit [never ending] life?" And, behold, a certain lawyer stood up to tempt him, and said: Teacher, what shall I do to inherit eternal life? And a certain teacher of the law got up and put him to the test, saying, Master, what have I to do so that I may have eternal life? And behold, a lawyer stood up to put him to the test, saying, "Teacher, what shall I do to inherit eternal life?" Then a doctor of the law stood up to try him, saying, master, what shall I do to inherit eternal life? And behold, a certain lawyer stood up tempting him, and saying, Teacher, having done what, shall I inherit life eternal? And behold, a certain lawyer stood up tempting Him, saying, Teacher, having done what shall I inherit eternal life? Then an expert in the Law got up to test him and said, "Master, what must I do to make sure of eternal life?" And behold, a certain scribe stood up, and trying him, said, Master, what shall I do, to inherit eternal life? And, behold, a certain lawyer stood up and tempted him, saying, Master, what shall I do to inherit eternal life? And, behold, a certain lawyer stood up, and tested him, saying, Teacher, what shall I do to inherit eternal life? And behold, a certain legal expert stood up to test him, saying, "Teacher, what must I do so that I will inherit eternal life?" And behold, a certain lawyer stood up, and tempted him, saying, "Master what shall I do, to inherit eternal life?" Now a jurist got up to tempt him. "Teacher," he said, "what am I to do to inherit life eternal?" Then a certain lawyer stood up and tempted him. "Master," he said "what shall I do to inherit eternal life?" Now an expert in religious law stood up to test Jesus, saying, "Teacher, what must I do to inherit eternal life?" And just then a certain Law scholar stood up and tested him, saying, "Teacher, what shall I do to inherit eternal life?" And lo! a certain lawyer stood up to try him, saying, Teacher, what shall I do to inherit everlasting life? AND behold, a certain lawyer stood up to try him, saying, Teacher, what shall I do to inherit eternal life? And lo! a certain lawyer, arose, putting him to the test, saying - Teacher! by doing what, shall I inherit, life age-abiding? And, behold, a certain doctor of the law arose, to make trial of him, saying, Master, by doing what shall I inherit eternal life? Just then a Student of the Law came forward to test Jesus further. "Teacher," he said, "what must I do if I am to 'gain Immortal Life'?" And behold, a certain lawyer stood up, and tempted him, saying, Master, what shall I do to inherit eternal life? Then an expounder of the Law stood up to test Him with a question. "Rabbi," he asked, "what shall I do to inherit the Life of the Ages?" Just then an expert in the law got up to test Him by asking, "Teacher, what shall I do to get possession of eternal life?" And, behold, a certain lawyer stood up, tempting Him, saying, "Teacher, by doing what shall I inherit eternal life?" And behold, a lawyer stood up to try Him, and said, Master, what must I do to inherit eternal life? 24 for I say to you, that many prophets and kings wished to see the things which you see, and did not see them, and to hear the things which you hear, and did not hear them." 25 And a lawyer stood up and put Him to the test, saying, "Teacher, what shall I do to inherit eternal life?" 26 And He said to him, "What is written in the Law? How does it read to you?" A ruler questioned Him, saying, "Good Teacher, what shall I do to inherit eternal life?" And someone came to Him and said, "Teacher, what good thing shall I do that I may obtain eternal life?" But when the Pharisees heard that Jesus had silenced the Sadducees, they gathered themselves together. One of the lawyers said to Him in reply, "Teacher, when You say this, You insult us too." and after he brought them out, he said, "Sirs, what must I do to be saved?" For if the inheritance is based on law, it is no longer based on a promise; but God has granted it to Abraham by means of a promise.